A bit of basic poker strategy for new no-limit hold’em players, here are a few tips that will help you before you start splashing around. – Be selective with starting hands. Play a tight range of hands, at least if you are new to the game. Stick to hands such as AA/KK/QQ/AK/JJ/AQ/AJ/KQ and pairs 77+. – Position is king. The later you get to act in a hand the more information you receive regarding the strength of your opponent’s holdings. If you feel like getting creative, do it in late position. The button is the best position to play from. – Play the player. Players can go on tilt. If you make a huge bluff, you have the opportunity to show the cards and put your opponent off his game. Playing against someone who is on steaming monkey tilt is ideal. Pay close attention to showdowns and keep in mind how players represented their hands. – Bluff with moderation. To win in poker you must bluff, but you can’t do it all the time. Especially against weak players who call a lot. Pick your spots wisely. Some of the worst players can be found in casinos online. It’s a powerful play. If you know how to use it correctly you won’t just make more money, but your table image will improve. Whether you play live poker or online poker, check-raising is a skill you must utilize if you want to be a strong all-around player. A good approach to using this play is to set your table image as tight. Even though you’re folding and/or playing straightforward early, you’re really setting a trap for later. Just when everyone thinks you’re playing by the book and you hit a big hand, check. Keep in mind – you want to wait to do this against someone who likes to bet. If you do it against a tight player, you’re not going to get paid. But, against an aggressive player you can win a big pot. Many times after an aggro sees a ‘tight’ player check, they’ll bet. Even if you’re just starting to learn poker there’s an even better way to use this play, check-raise semi-bluff. This is when you call a pre-flop bet out of position and flop a draw. You may not have the best hand but you have outs to hit the nuts or close to it. In Texas Hold ‘em you want to protect a made hand on each street by betting enough to force a player to made an improper call based on the odds of making a hand. If someone sees a check-raise on the flop or turn, they’ll think you’re ahead trying to protect your hand. If you check-raise on the river, they’ll think they’re beat most of the time. Regardless of what street you’re on (flop, turn, river), the check-raise is scary. To make sure you’re using this play at the right time, you must have a good idea of what your opponent is holding and their tendencies. 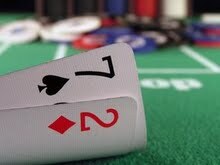 For instance, if they raised pre-flop, the flop has an ace and they bet big they’re probably trying to protect top pair. This is a good time to check-raise, unless they’re the type of player that can’t fold top pair. If you think your opponent has less than two pair and knows where the fold button is, blast away. Be careful not to use this play against a calling station. It’s important to know your opponent. In conclusion, use your check-raises in poker against the right people at the right time. If you get re-raised, fold. If you get called, check. Minimize losses, maximize gains. Implement check-raising into your poker game today and watch your bankroll grow.